Rafi Letzter/Business InsiderA California judge has ruled that Starbucks must add warning labels to its coffee cups. A California judge has ruled that Starbucks must add cancer warning labels to its coffee cups. A lawsuit filed in 2010 accused coffee companies of violating state law by not warning consumers that a chemical in their products could cause cancer. The National Coffee Association has indicated the companies are considering appealing the case. 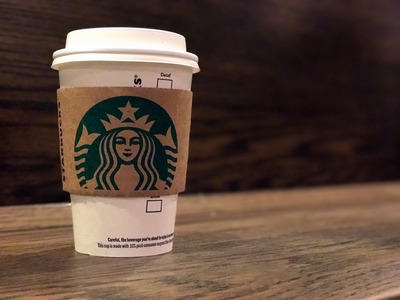 Starbucks drinkers in California can expect to see cancer warning labels on their coffee cups in the future. On Wednesday, a Los Angeles judge ruled in favour of a nonprofit that sued 90 coffee companies over claims that they had failed to comply with a state law that requires businesses to warn consumers about chemicals in their products that could cause cancer, Reuters reported. The lawsuit, filed in 2010 by the Council for Education and Research on Toxics, pointed to a chemical called acrylamide that exists in brewed coffee. According to Reuters, some of the other defendants had already agreed to put warnings on their products and pay millions of dollars in fines before Wednesday’s decision. Other companies – including Starbucks, McDonald’s, and Dunkin’ Doughnuts – have until April 10 to file appeals.